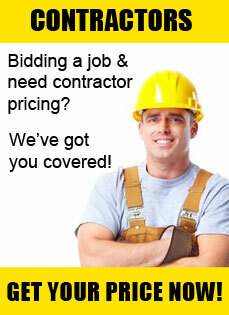 Ball Valves | Huge Savings On All Ball Valve Orders! 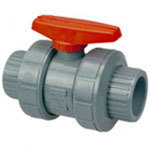 Ball valves are highly used valves in the PVC market. 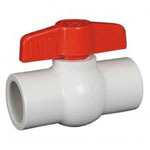 Ball valves are used to stop flow in the PVC Piping system. 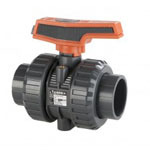 There are two different types of ball valves and they are compact ball valves and true union ball valves. 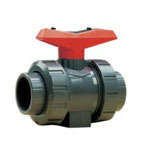 Compact Ball valves are a one piece ball valve that are manufactured with glue or threaded ends. 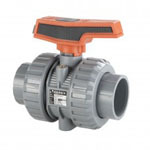 True Union Ball Valves come with union ends that are either socket or threaded and are used in more industrial application. True Union ball valves can be easily repaired or replaced in line because of the union ends that they are manufactured with. 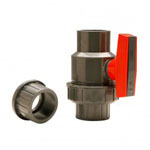 These valves are popular in many applications because of the ease of working with the valve and the sturdiness of the valve. 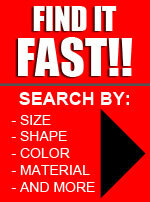 Ball valves come equipped with a handle that allows a quarter turn to cut the flow in the piping system off or on. Ball valves are pressure tested to handle 150 PSI and can handle temperatures that reach up to 140 degrees F.